Started in 2008 in San Francisco, Open Show is a series of free community-organised social screening events taking place worldwide. Described as a “global network of local events”, Open Show is currently active in five cities in India: New Delhi, Mumbai, Bangalore, Hyderabad, and Pune. Open Show organises free social screenings of compelling work from photographers, filmmakers, and multimedia artists. The idea behind the events is to encourage young artists—the audience present can view compelling work and interact directly with filmmakers and multimedia producers in high-profile spaces. Five selected artists are given 10 minutes each to showcase their work, while the audience poses questions and provides feedback. In Pune, the first Open Show event occurred in June 2012. “A bunch of practitioners strongly felt that Pune was lacking the culture of and access to curated, thoughtfully exhibited photography,” says Open Show Pune co-producer Vatsala Goel. “The kind of photography we were seeing in galleries here seemed limited to the pictorial or photojournalistic variety. The funds to support a purely aesthetic and informative venture are non-existent at the moment. 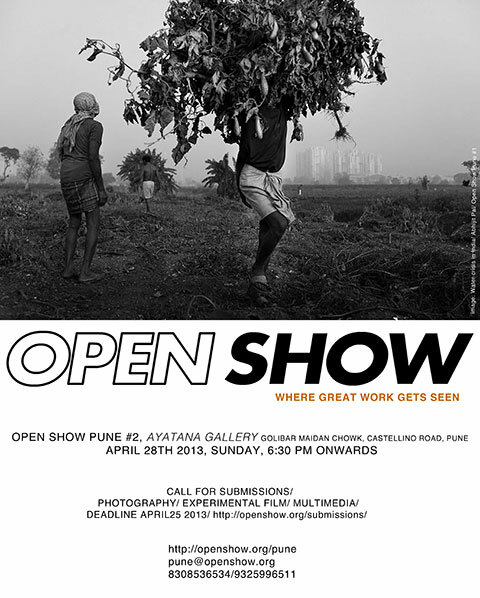 The second edition of Open Show Pune is scheduled for April 28, 2013. The initiative is looking for submissions from multimedia artists, photographers, and filmmakers in the city, the deadline for which is April 25, 2013. Those of you who would like to showcase your work can click here to learn more about the project requirements and to upload your project. If you’re in Pune this weekend, head on over to Ayatana Gallery on Sunday to be a part of this promising initiative. Time: 6.30 p.m. to 9.30 p.m.